Quick overview Learn essential urban sketching tips for drawing buildings and street scenes with over 200 images from 40 international artists. Brimming with inspirational art, this book is a sketching guide that is also packed with tips to help you identify architectural features along the way. The urban sketcher's ultimate guide to drawing buildings! Whether it's a suburban street scene or a vast city skyline, learn all the skills you need to improve your sketches and capture the essence of your surroundings wherever you are - from seaside ports to bustling urban markets. With Archisketcher as your guide, not only will you develop your understanding of perspective, colour theory and composition, but you can also learn all about important architectural features and styles. 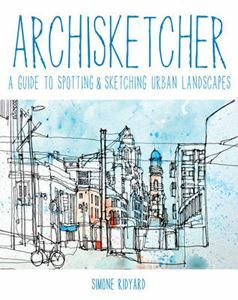 * Features inspirational artwork from 40 international urban sketchers * Includes insights and tips for sketching everything from architectural monuments, like La Sagrada Familia, to everyday urban street scenes in English suburbia * Highlights five major architectural landmarks and shows you how other sketchers have approached and interpreted these icons, inspiring you to have a go yourself! * Learn to identify common architectural features such as doric columns, buttresses and rose windows No matter where you choose to sketch, Archisketcher can help inspire your creativity and improve your urban sketching skills.